As protests became fodder for headlines all over the world — the Arab spring has already overthrown the governments of Tunisia, Libya and Egypt between 2010 and 2011; the Occupy Wallstreet’s rage against capitalism spread the world over and student riots in London — news on war and peace in Davao City and in the South continue. No matter how official authorities would try to stop these, the trend is very clear: in Davao City and elsewhere in the world, many are challenging the status quo. DAVAO CITY, Philippines — In November, Davao was tagged as the only Philippine city to be part of the top 100 fastest growing cities in the world. Government officials were thrilled but at the city’s outskirts and adjacent provinces, peasant folk were not as happy as villages were disrupted with scouring soldiers. Peasants have called for the withdrawal of a detachment of the 69th Infantry Battalion in Barangay Paradise Embac, a headquarters perched few meters away from a public school. Education authorities, local councilors and rights advocates listened to residents — an on-site committee hearing was even conducted — but the military found an ally in Mayor Sara Duterte who saw nothing wrong in a civilian-ensconced military detachment. Lumad residents in Paquibato district were also alarmed with the threat of pangayaw or tribal war, after pro-military Lumad leaders threatened residents with the revival of the notorious Alamara paramilitary forces. As the threats hovered in September, a coconut gatherer, Debirth Zabala was mistaken as an NPA (New People’s Army) fighter and was roundly arrested and detained. Red baiting and counter-insurgency issues also hounded other parts outside of Davao City. The year 2011 saw brutal murders, among other human rights abuses, against innocent civilians and even against a Catholic priest by elements of the military and its paramilitary groups. Father Fausto ‘Pops’ Tentorio, PIME (Pontifical Institute of Foreign Missions) was shot to death many times right in his parish’s vicinity in Arakan, North Cotabato, October 17. The killing, which human rights groups linked to the AFP, was widely condemned. Before new year of 2012 arrived, an accused gunman was captured, but the arrest posed more questions. Three days after Father Pops’s death, peasant Ramon Batoy was killed by elements of the 5th Special Forces under the 57th IB in Sitio Upper Lumbo, Barangay Kabalantian, Arakan. Batoy was able to put up a fight and struck two soldiers with his bolo, killing one and wounding the other, before he was riddled with bullets. He was accused as an NPA along with two of his neighbors, Noli Badol and Celso Batol, who were tortured and detained by the military. The two were later imprisoned and filed with trumped-up charges. These cases appear to oppose the supposed benefits of the Aquino government’s Oplan Bayanihan, its counter-insurgency program unveiled January of 2011. 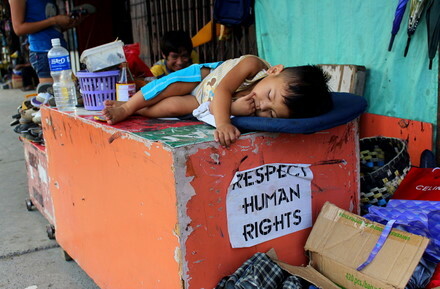 In Southern Mindanao alone, from January to December 7 of 2011, human rights organization KARAPATAN recorded a total of 190 violations of civil and political rights victimizing 10,429 individuals and 1,470 families. But since President Aquino came to power in July 2010, a total of 263 violations of civil and political rights were recorded victimizing 18,265 individuals and 2,192 families. Eight have become victims of extrajudicial killings this year. The Commission on Human Rights (CHR)-XI, however, according to Franchie Buhayan, BAYAN-Southern Mindanao’s Secretary General, “has not made any single step as to recommend the filing of cases against state agents who have been involved in the killings.” “The people can only expect further delay of justice as long as the CHR remains inutile over the cases of human rights violations,” she added. The local government may be hard put in reinventing Davao as a fast-growing urban center in these parts of the country, but battles were fought in the countryside all year round. In the city’s Paquibato district, report from the AFP’s 10th Infantry Division (10th ID) said its unit, the 69th IB, and the Philippine National Police’s (PNP) Special Action Force suffered 10 casualties — eight wounded and two dead — in an encounter with the NPA’s 1st Pulang Bagani Company at Sitio (sub-village) Guinobatan, Barangay Paradise Embac, Paquibato, January 18. The military said communist guerillas used an improvised explosive device or what the latter says in their statements, command-detonated explosives (CDX). Still in the same place, the NPAs harassed government troops, September 17. One soldier was reported wounded. In Purok 5, Barangay Mapula, communist guerillas reportedly killed two government troops under the 72nd Cadre Battalion, September 21 and in November 10, another army corporal, Wenie Carampatana, was reportedly killed by the NPAs in Barangay Poblacion, Malabog. Elsewhere in the city, in Marilog district, government troops from the 69th IB engaged the NPAs in Sitio Dumalogdog, Barangay Gumitan, July 24. One killed and another wounded from the government side were reported. In Toril district, communist guerillas reportedly harassed a military detachment in Barangay Baracatan, January 18. In other provinces, civil war raged in the year 2011. In Davao del Sur, communist guerillas clashed with troops from Task Group Mulawin of the 1002nd Infantry Brigade in Sitio Tambolang, Barangay Datu Danwata, Malita, September 16. In Davao del Norte, three soldiers from the 3rd Special Forces Battalion (3rd SFBn) were ambushed by the NPAs, January 6, in Barangay Magdum, Tagum City. The 3rd SFBn clashed with the NPAs in Barangay Mambing, New Corella, February 2. One soldier was reported wounded-in-action. In Panabo City, communist guerillas attacked a police detachment, March 20. One police officer was killed and another two were reported wounded. In Barangay Dalisay of the same town, the NPAs attacked troops of the 60th IB, July 29. One soldier was wounded. In Sitio Lagandang, Barangay Suaon, Kapalong, troops from the 60th IB clashed with the communist guerillas, March 26. One NPA was reported killed. And in Barangay Igangon, San Isidro, 60th IB troops and their vehicle were hit by NPA’s CDX, October 14. In Compostela Valley, the NPAs reportedly harassed soldiers in Barangay Lebanon, Montevista, January 23. In Sitio Tanawan, Barangay Malinawan, Mawab, NPAs attacked troops from the 101st Division Recon Company (101st DRC), March 11. An Army lieutenant was reported killed. In Barangay Casoon, Monkayo, NPAs and the 5th Scout Ranger Company (5th SRC) clashed, March 21. Two NPAs were reported wounded. On the same day, the 101st DRC clashed with communist guerillas at Sitio Tagaytay, Barangay Mipangi, Nabunturan. One NPA was reported killed. In Barangay Bullukan, Laak, elements from the PNP’s Laak Municipal Police Station were ambushed by the communist guerillas, April 5. In Barangay Parasanon, Maragusan, four soldiers from the 5th SRC were killed when hit by the NPA’s CDX, April 15. In Sitio Upper Logdeck, Barangay Poblacion, Montevista, the NPA ambushed troops from the 25th IB, July 16. One soldier was reported wounded-in-action. In Sitio San Miguel, Barangay Kidawa, Laak, soldiers were hit by the NPA’s CDX, October 12. Two soldiers were reported wounded. In Sitio Kalinuga, Casoon, Monkayo, troops from the 25th IB were hit by the NPA’s CDX, November 20. Two soldiers were reported wounded-in-action. In Davao Oriental, an Army lieutenant was wounded-in-action when communist guerillas engaged with the composite team of 67th IB and 4th SRC in Barangay Old Macopa, Manay, January 22. In Sitio Magobahong, Barangay Abejod, Cateel, troops from the 67th IB clashed with the NPAs, August 12. The next day, in Upper Mahu, Barangay Abejod of the same town, troops from the 4th SRC and the NPA clashed. In Sitio Kinawisan, Barangay San Isidro, Lupon, troops from the 28th IB clashed with the NPAs, November 8. One killed and three wounded on the government side were reported. While the battle between communist guerillas and government troops continued all year round, and despite heavy military and police operations, the National Democratic Front has managed to release 13 of its prisoners of war (POWs) and detainees. In February 18, Master Sergeant Mario Veluz was released by the NPA’s Herminio Alfonso Command (HAC). He was arrested during an NPA checkpoint along the Davao-Bukidnon national highway, February 6. On February 19, Police Officer 3 (PO3) Jorge Sabatin was released by the Conrado Heredia Command (CHC) of the NPA. Sabatin is a member of the PNP’s 1403rd Police Provincial Mobile Group. He surrendered to the NPA during the latter’s raid and disarming operation against a PNP outpost in Barangay Pulang Lupa in Trento, Agusan del Sur, February 1. Two days after Sabatin’s release, two additional POWs were simultaneously released by the NPA. In February 21, Private First Class (PFC) El Bryan Cañedo was released by the NPAs Front 25 Operations Command. Cañedo, personnel of the 5th SRC of the 2nd Scout Ranger Battalion, was arrested in an NPA checkpoint along the national highway in Barangay Maparat, Compostela in Compostela Valley province, February 7. PO2 Jerwel Montecillo Tugade was also released by the NPA’s Wilfredo Zapanta Command. Tugade was a member of the PNP’s 1106th Provincial Mobile Group. He was arrested in a mobile checkpoint mounted by the NPA along the Tagum-Mati national highway in Barangay Pintatagan, Banaybanay, Davao Oriental, February 7. In May 29, the NPA’s HAC released Corporal Delfin Largo Sarocam and PFC Jayson Burgos Valenzuela. Both were members of the 57th IB of the AFP’s 6th Infantry Division. The NPA arrested them while they were conducting “intelligence operations” against communist guerillas in Barangay Datu Inda, President Roxas in North Cotabato last April 14. Last October 8, four personnel of the Bureau of Jail Management and Penology were released by the NPA’s HAC. They were PNP Officer/Jail Inspector Murphy Todyog, PNP Officer/Jail Inspector Eric Llamasares, Special Jail Officer 2 Rogelio Begontes and Jail Officer 1 Rolando Bajuyo, Jr. The four were taken into custody by the NPA in the course of the latter’s operation — effecting the release of their comrade Dennis Rodinas — in Barangay Sinuda, Kitaotao, Bukidnon, July 21. A day after the release of the four BJMP personnel, Lingig, Surigao del Sur Mayor Henry Dano and his two military escorts — Corporal Alrey Villasis Desamparado and PFC Allan Pelino — of the 4th Infantry Division’s 75th IB Intelligence Section were released by the NPA’s CHC. Dano was disarmed by communist guerillas right in his house, August 6, and was taken into NPA custody to face accusation of maintaining a private army and participating in counterrevolutionary activities. His military intelligence escorts were also taken as POWs. The military wanted to defeat communist rebellion by “winning the hearts and minds” of civilians through “peace and development outreach programs” (PDOPs). Major General Jorge Segovia, commander of the 10th ID, said PDOPs “will contribute in solving the root causes of insurgency.” The military has intensified its PDOPs as they shifted their focus in the Davao region claiming it as the new “epicenter” of Communist rebellion. It is considered the military’s “national priority” for its anti-Communist campaign because, according to the AFP, it has the highest number of NPA fronts across the nation. The military said PDOPs are designed not to hunt down communist guerillas but it has deployed a total of 19 military battalions with around 10,000 troops exclusive of paramilitary units and vigilante groups in the region. As battles are being fought and as rights abuses are echoed again and again by advocates, many have again popped up the question on whether peace is still possible. In two separate occasions in 2011, and attended by hundreds of advocates and local authorities, high-ranking officials of the National Democratic Front of the Philippines (NDFP) negotiating panel visited Davao City to talk about the peace talks. NDF Joint Monitoring Committee chairperson Fidel Agcaoili first came to tackle updates on the peace talks. Luis Jalandoni, chairperson of the NDF peace panel later came along with his wife Connie Ledesma, and personally invited Davao City Vice Mayor Rodrigo Duterte to become the NDF panel’s resource person. Duterte later turned down the offer citing a memo from Department of Interior and Local Government Secretary Jesse Robredo which barred him on account of the former being a public official. The GPH and the NDFP peace talks are far from completion, 19 years since The Hague Joint Declaration was signed in 1992. With only one — the Comprehensive Agreement on Respect for Human Rights and International Humanitarian Law (CARHRIHL) — out of the four substantive agenda bilaterally concurred, root causes of the longtime and raging civil war are still not addressed; and just and lasting peace is way beyond reach as the GPH and its state agents — the AFP, the PNP, their paramilitary groups and intelligence units — continue to violate the CARHRIHL, an agreement considered a milestone in the history of resolving Southeast Asia’s longest-running armed conflict to date. Barely two weeks before the Filipinos celebrated the traditional Christmas and New Year holidays, both the Government of the Philippines (GPH) under Aquino and the CPP declared a ceasefire. The Aquino government declared an 18-day ceasefire while the CPP issued a ceasefire order to all its NPA commands, units and people’s militia on December 24 to 26 and on December 31 to January 2. It can be recalled that while the GPH ceasefire was in effect early 2011, at exactly January 1, NDFP Consultant and JASIG (Joint Agreement on Safety and Immunity Guarantees)-protected Edwin Brigano, was arrested by government troops in Toril, Davao City. He was undergoing medical treatment. Almost 15 NDFP consultants are still in prison even when a number of NPA POWs and captives have been safely and orderly released by their NPA custodial units. While these occurred, the formal peace talks between the GPH and the NDFP pushed in February. The last talks between the two parties occurred in September but since then, it has not resumed after facing major obstacles. And as 2011 ends, this could be an indication that the peace negotiation between them hangs by a thread. And as peace was a thorny issue at the national levels, it was also a controversial one at the local level. Davao City Mayor Sara Duterte made public her stance that peace can only be had if leaders from the revolutionary movement would lay down their arms, to the point that she called on NPA’s Ka Parago and Ka Oda, two known NPA figures in the city, to surrender. The NPA’s Merardo Arce Command had since rebuked Mayor Duterte for her “reactionary” attitude.